3000W rated power copper core cable allows all the 10 sockets and 4 USB port simultaneously works without a break. Rated power： 3000W. Rate current: 13A. MULTIPLE SOCKET & USB CONNECTOR:The tower vertical surge protector power strip all outlets and ports are distributed vertically in the four sides of the tower vertical power strip, providing enough space between each outlet that saves space and eliminate the risk of electric shock hazard. Surge supressor. Plug the device you want to protect into the MiaVolt surge protector. - Protector against blackouts. - Compact size. - Easy installation. - Protects refrigerators with & without electronic systems. 300J Surge Protection. AC 15A 125V 60Hz 1875W. 12 Outlet Power Strip. 4 ft Power Cord. Includes Wall Mounting Brackets. Space saving. All-in-one power strip tower for multiple devices. - With 3 independent switches for each layer of power sockets. 1 x Power Strip 1 x English User Manual. - Electric conductor: High quality phosphor copper. Computers, TVs and more. 6 Outlet 6 USB Power Strip. Power Strip. 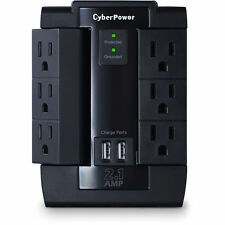 1 x Poweradd 6 Outlet 6 USB Port Power Strip. Outlet Quantity: 6 AC Plugs 6 USB Ports. Material: Fire-resistance PC shell, PVC copper wire. The Monster Power MP HDP 900G Home Theater Surge Protector is an advanced 8 outlet PowerCenter surge protector that provides high capacity surge protection for home theaters and computers and is also a GreenPower surge protector with switched outlets to save energy. 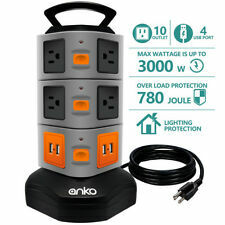 This surge protector has advanced features such as Dual Mode Plus Auto Disconnect with an audible alarm and AC power disconnect, 3240 joules of surge protection, a FlatProfile power plug and 24k gold contacts. There is a "Protection On" LED light that shows when SurgeGuard is acitvated and "Ground OK" LED to show when grounded. Maximize your outlets using the six-outlet General Purpose Power Strip from GE. 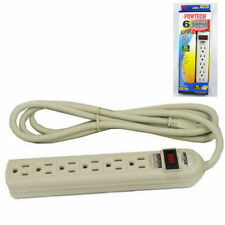 The GE six-outlet General Purpose Power Strip is intended for indoor use only. Integrated circuit breaker. Six grounded outlets. 6 OUTLET POWER STRIP AND SURGE PROTECTOR. Maximum Energy Dissipation - 90 Joules. WITH RESET CIRCUIT BREAKER T-TYPE. UL LISTED. OFFICE PRODUCTS. COLOR- IVORY. 1875 WATTS. SMALL KITCHEN APPLIANCES. 4000J for Maximum Surge Protection. AC 15A 125V 60Hz 1875W. 12 Outlet Power Strip. 2 USB Ports DC5V 2.1A. 3 ft Power Cord. ETL Certified. Surge Energy: 300J. 2 mounting holes can hang the outlet on walls, baseboards, or furniture easily and horizontally, used as wall adapter. 1×3-Outlet Power Strip. - Outlet Quantity: 3 AC plugs 3 USB outlets. 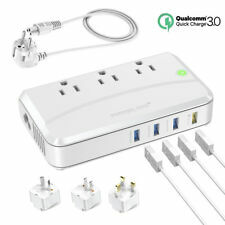 6 x US plugs power sockets (for PC appliances, TVs, digital boxes, kitchen appliances and so on. Smart and Fast : 6 USB ports: 5V /2.4A 2 / 1A 4 (Max 6A) desktop USB charging port for iPhone 6s / 6s Plus /6/ 6 Plus / 5S / 5, iPad Air / Mini, Samsung Galaxy Note 4 / Note 3 / Note 2 / S6 / S6 Edge / S5 / S4 / S3, Google Nexus and other smartphone and tablet, MP3 players, and other USB powered devices. ). Power switch with integrated 15Amp circuit breaker protects against overload. Surge Protection. -15-amp circuit breaker. -Lighted, On/ Off switch with transparent snap-over guard. Maximum Line Current. ..
8 SWITCH PLUG OUTLET POWER SUPPLY DISTRIBUTION BLOCK AC STRIP SURGE PROTECTOR 8 Outlet Rack Mount Power Supply Center w/Each Outlet Switch A Power Management System is an easy way to keep your rack mount equipment and power cables neat and organized. This Provides cooler operating temperatures by reducing clutter which in turn will provide you with better performance out of your equipment. Built-In Sepperate Switches For Each Outlet Can manage power for other units Please Note: The Switches do Not Illuminate on this unit. (They Do Not Light Up). Includes Manual and Detachable Power Cord. Rack mount brackets 110/220V compatible 19''L X 3.1''W X 1.7''H. Surge indicator light glows red to let you know when your covered! Maximum Surge Energy: 1200. Power strip has 8 outlets, 3 spaced outlets to provide space for large adapters and 5 regular outlets. 6 feet power cord goes and stays were you need it, built-in cord wrap for easy cord storage. This Powtech Single surge protector adds protection to your electronic devices with inexpensive, compact single outlet plug-in design. 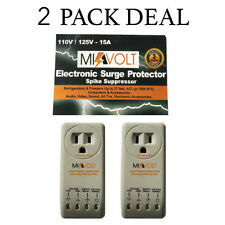 It is perfect for travelers too, and will provide 270 Joules surge protection for devices up to 1875 Watts on the go. KEDSUM WiFi Smart Power Strip, Surge Protector with 4 USB Ports and 4 AC Outlets, Smart Plug Remote Control Outlet with Timer Via App Android/IOS Smart phone, Work with Alexa/Google Home/Amazon Echo. This electrical outlet strip designed for mounting in or on an electronic cabinet, workbench, lab table or OEM application. There are 12 single outlets on the mountable power strip with a 15ft heavy duty grounded extension cord. The Monster Power AV 775G is an advanced 7 outlet PowerCenter surge protector that provides high capacity surge protection for home theaters and computers. This surge protector features advanced features such as Dual Mode Plus Auto Disconnect with an audible alarm and AC power disconnect, 2160 joules of surge protection, a FlatProfile power plug and 24k gold contacts. There is a "Protection On" LED light that shows when SurgeGuard is acitvated and "Ground OK" LED to show when grounded. Your electronics need protection from surges and spikes and the Monster Power AV 775G GreenPower Surge Protector can help provide the protection you need for today's advanced electronics. The Monster Power MDP 850G Home Theater Surge Protector is an advanced 8 outlet PowerCenter surge protector that provides high capacity surge protection for home theaters and computers and is also a GreenPower surge protector with switched outlets to save energy. This surge protector features advanced features such as Dual Mode Plus Auto Disconnect with an audible alarm and AC power disconnect, 2160 joules of surge protection, HD Clean Power Stage 1 Filtering, a FlatProfile power plug, and 24k gold contacts. Your electronics need protection from surges and spikes, and your computer system also needs the same protection, the Monster Power MDP 850G PowerCenter Surge Protector can help provide the protection you need for today's home theaters and computers. Space saving. All-in-one power strip tower for multiple devices. - Electric conductor: High quality phosphor copper. - With 3 independent switches for each layer of power sockets. 1 x Power Strip 1 x English User Manual. Cord Length: 5ft power cord. Power Strip. A 5 ft heavy-duty power cord allows you to keep the power strip in an unobtrusive location while making sure it reaches your devices. Outlet Quantity: 3 AC plugs 3 USB outlets. 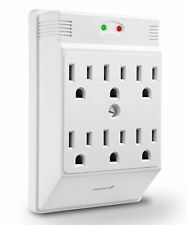 Simply plug it into a wall outlet, and it gives you up to 12 surge-protected AC outlets (four fixed AC outlets & eight 90-degree rotating AC outlets), three surge-protected RJ11 interfaces and a pair of surge-protected coax jacks. 6 Grounded Outlets. On/Off Switch with built in 15 amp Circuit Breaker. Frequency 60 Hz. Built in hanging brackerts. Compatibile for Apple iphone/ipad all series products, Samsung Galaxy, Huawei and other USB devices. Compact size and stylish outlook, providing a wide range of power distribution. Compact Power Strip. Up for sale is are lot of 4 Sunbeam Advanced 7 Outlet Power Strip/Outlet With Surge Protector. Condition is New. Hurry this will not last long! Great deal. Sliding Protection Covers. Purecurrent(tm) technology improves picture, sound & performance by purifying dirty power. 65db emi/rfi protection. The housing is built using Aluminum for durability. Easy and highly versatile to install whether the application requires horizontal or vertical installation. UL approved provides safety and protection when in use. Cord Length: 5FT white cable. A 5-feet heavy-duty power cord allows you to keep the surge protector in an unobtrusive location while making sure it reaches your devices. Material: Fire-resistance PC shell, PVC copper wire. Emi or rfi noise filter is 150 KHz to 100 MHz, up to 75 dB. 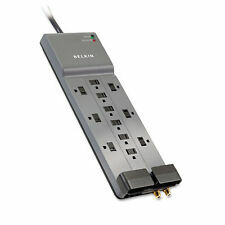 Belkin BE112230-08 12-Outlet Power Strip Surge Protector. Emi or rfi noise filter is 150 KHz to 100 MHz, up to 75 dB. Poweradd 3-Outlet Power Strip 5-foot Heavy Duty Extension Cord with 3 USB Charging Ports——White. -- 3 USB charging ports, including 1 high output 2.1A USB ports for power-hungry devices such as high-end smartphones, ipad, external batteries and 2 universal 1A ports for all phones, MP3 players, and other USB powered devices. Monster® Fireproof Power protege su hogar y su familia. With Furman’s Power Station Series, everyone can reap the benefits of unrivaled power purification and unequalled surge protection. Typical AC filters feature antiquated non-linear circuits. In fact, they can add noise to your power line due to their filter’s excessive resonant peaking. Maximun Output: 1875W. Maximum Current: 15A. Sturdy aluminum rack-mount socket case and larger spacing between the outlet, applied to large plugs and safe design. Just slip the base of the power strip over the heads of the fasteners and then tug the strip downward (or upward) to "lock" it into place. Surge Protector Power Strip, Safety Universal Electric Charging Station with with 10 Outlets 4 USB/Rotating Tower/ 6 feet Cord Wire Extension Power Strip Tower. MULTIPLE SOCKET & USB CONNECTOR - The tower vertical surge protector power strip all outlets and ports are distributed vertically in the four sides of the tower vertical power strip, providing enough space between each outlet that saves space and eliminate the risk of electric shock hazard. Model: P8U2. Surge Arrest. Surge Protection. Smart Charging. Power Cord: 6 Foot. >>UL certificate:Comply with UL/CUL Certification,high strength fireproof ABS material and high-end solid capacitor ensure complete protection for your devices safety. Surge Energy: 900J. USB Ports: 2 ports. THIS ARRESTER IS THE NEW 3rd EDITION SURGE PROTECTOR CAN PROTECT YOUR WHOLE ENTIRE HOUSE FROM LIGHTING. THIS SYCOM SURGE PROTECTOR IS ONE OF THE BEST ON THE MARKET RIGHT NOW. NEW SYCOM HARDWIRE 120/240 VOLT SURGE PROTECTOR. 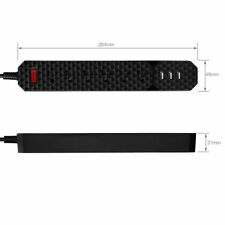 Plus, the extra-long 6ft power cord allows you to place your power strip anywhere you like. Power Strip. Cord Length. Individual illuminated on / off switch for each outlet. Output Amperage Capacity. MULTI-OUTLET FUNCTION: The Nekteck Power Strip has 10 surge-protected AC outlets that is compatible worldwide with 100-240V input and 3 built-in USB ports that provide 3A maximum. 1 x Nekteck 4.8ft Cord Power Strip [4.8ft 10 AC 3 USB]. Space saving. All-in-one power strip tower for multiple devices. - With 3 independent switches for each layer of power sockets. 1 x Power Strip 1 x English User Manual. - Rated Current: 10A. - Rated Power: 2500W. Heavy Duty Cord ----------------------------------------------15 Feet. Maximum Line Current --------------------------15AMP / 1875Watts. 3-Wire Grounding Outlets ------------------------------------------12.